An historic trend is under way right now at master-planned communities, especially ones that have focused on golf. Simply stated, the focus is less on golf and more on a total recreational experience. This transition may mean that the community you are looking at today may have one less golf course in the future. But it also provides you with positive benefits. You and your family will have more and varied amenities to enjoy and more opportunities to experience the natural aspects of the community with your children and grandchildren. And just as important, this trend may ensure the viability of communities that had been facing an uncertain future. Generations can enjoy numerous activities together. Today, amenity communities today must adapt to the changing conditions and demographics of the marketplace. Some residential communities have even shut down golf operations entirely to create new and surprising opportunities for a more diverse menu of amenities. Property owner associations are also asking themselves important questions about how to prosper in the post-golf boom era. These questions stem from the new interests of younger buyers and the evolving interests of those approaching retirement. Questions that arise include: how to broaden the community’s appeal, what exciting opportunities arise from former golf course property, what are today’s buyers seeking and what should be provided? Today’s buyers seek access to aesthetics, amenities. Today’s 75 million Boomers and 83 million Millennials represent the two largest segments in the real estate market. Both groups are active and want to stay connected to peers and family. Having access to nature, hiking, walking and biking, canoeing and kayaking and swimming remain among the highest-ranked activities today. Multi-generational swimming pools, welcoming village greens for community events, festivals and recreation, and small quaint retail villages and walking by water are all key amenities smart community executives have added to their communities. Eighteen-hole golf courses typically occupy between 150 and 300 acres of land. Communities that close courses are faced with the exciting proposition of how to best utilize this land asset in a way that is compatible with surrounding real estate while enhancing community values. Land occupied by golf fairways lined by real estate is well suited to conversion to linear parks and open space, providing much sought after destinations for walking, hiking and biking in a natural setting. Existing cart paths are perfect for this use. Golf courses are fertile, irrigated land which can be easily recrafted and reforested using best management practices. They can also be converted to meadows with open vistas, and lakes with bicycle and pedestrian bridges. 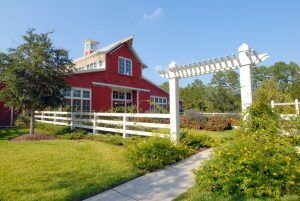 Community farms and gardens are a good use for practice fairways and offer homeowners the opportunity to connect and socialize while growing healthy food locally. Former golf course land is giving birth to added recreation facilities such as multi-generation swimming pools and recreation centers. Fields for soccer, lacrosse and baseball are perfect venues for former practice fairways. These attractive additions serve to enhance community values and attract both Millennials with children and Boomers with grandchildren. Kayaking, fishing and other water activities are popular options. Water is another opportunity. Lagoons and lakes can be expanded and/or inter-connected to serve as blueways for canoeing, kayak and fishing. Wetlands can be restored or created to diversify wildlife habitats, treat storm water and provide learning and interpretive opportunities. Some lands can be set up in a conservation easement which can offer significant tax benefits to owners. Community foundations can be established to manage and maintain the assets. A good example of such a foundation is the Sea Pines Forrest Preserve Foundation on Hilton Head Island. Of course, these conversions cost the community money. Find out they cope in the next installment. Editor’s Note: And if you want to ask the land use experts at Wood+Partners how your community could benefit from this historic trend sweeping communities nationwide, click here. Homes for Sale in FL, NC, SC, GA & UT, Soloist Terry Barber at Mariner... Is Your Community Ready to Convert from Golf to Natural Amenities?